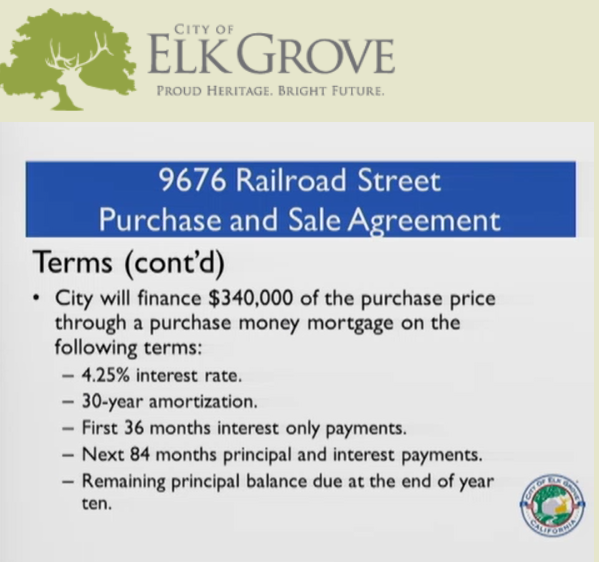 At their regular meeting last night, the Elk Grove City Council unanimously approved the sale of property taxpayers purchased for $420,000 at a discount price of $380,000 and provide financing to the buyers. The deal was the latest step in the city's ongoing efforts to revive the moribund Old Town special planning area located along Elk Grove Boulevard between Elk Grove-Florin and Waterman roads. According to a staff report presented during the meeting, the city purchased the property located at 9676 Railroad Street (see map below; identified as "avenue") for $420,000 in October 2017. After the purchase, the city had engaged in negotiations with D&S Development. The Sacramento-based developer, whose principals include Steve Lebastchi and David Miry, include in their portfolio of work the redevelopment of several buildings in Midtown Sacramento. Among the redevelopment projects consists of the 14th & R mixed-use facility and the Maydestone Apartments on J Street across from Memorial Auditorium. As part of the plan developed with input from the city, the redevelopment will be in three phases. In the first phase, the primary Railroad Street structure will be remodeled with the intent of recruiting a restaurant. When asked by Council Member Steve Detrick about the type of restaurant D&S was intending to recruit, city staff member Rachael Brown said they have not yet identified a potential tenant, but they hope to land a non-chain restaurant for the space. "They are very excited to start the planning process and get things going," Brown added. In the second phase, D&S has promised to independently buy another adjacent structure at 9699 Railroad Street. In the final stage, they said they would develop a mixed-use project, and when the entire project is completed, they would have invested $20 million. Construct two new parking lots on City-owned land to the north of the Property and south of the Old Town Plaza. Reconstruct Railroad Street from Elk Grove Boulevard to just north of Elk Grove Creek and the Elk Grove Water District property at the south end of the street. Construct new curb, gutter, and sidewalk along Railroad Street and Grove Street. Construct new gas, sanitary sewer, and water lines along Railroad Street – target completion of the above items is September/November 2019 to closely coincide with Phase I opening. Construct Old Town Plaza Phase II – target construction start is June 2020. All public Improvements are to be constructed by the City at its cost within City Right of Way. The City will process necessary General Plan amendments and rezoning in support of the private Improvements. Additionally, the city will finance $340,000 of the purchase price at a rate of 4.25-percent for 30 years. The terms of the loan note that the first three years will be all interest, years three through ten will be principal and interest, and at the ten-year mark, the balance of the loan will be due. Work on the restaurant facility is expected to start later this year. The city claims the entire project will create 220 new jobs. From what appears on the website, D & S has been involved in several successful projects. Given that the city is financing this venture and not a bank, which D & S must have some lending relationships with, is this an indicator that traditional lenders view this project as fraught with risk? The return on investment is the key ingredient to this taxpayer-funded pro-forma. Good luck on that. Old Town has been a blighted money pit for years and its private sector landowners have done virtually nothing to increase the investment climate over there. Investing in food is a trendy proposition at best. The biggest hurdle will be to lure the "other side of town" to travel way over yonder to the "poor side of town" and spend their time and money when a lot of other choices of their time and money exist on their side town. How do you spell future foreclosure? I do believe a fast talker can sell this city council on anything. I don’t know. I love over on the West side. My wife and I regularly travel into Old Elk Grove in the evening for a weekday date night. It’s an $8 Uber each way and we can eat and drink and Uber back home. What Id like to see are some more breweries that aren’t in the middle of nowhere.